According to the Texas Department of Transportation statistics in 2008, 35.18% of drivers involved in DUI fatalities were under the age of 25. 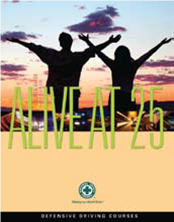 Preventing deaths among teen drivers and young adult drivers is the mission of Alive at 25. The course addresses the number one cause of death for drivers ages 15 – 24 – motor vehicle crashes – and zeroes in on the key issues that put new drivers in jeopardy — inexperience, distraction, peer pressure, the influence of drugs and alcohol, and a tendency to under estimate risk — in a way young adults can relate to. The program only takes 4 hours and is provided in English or in Spanish. Completion of the Alive at 25 Program may also qualify for an insurance premium reduction. The Alive at 25 program helps participants recognize that their casual attitudes toward driving can cause collisions and violations, and encourages them to adopt safer approaches to driving. The program emphasizes peer pressure and how to manage it and has a strong focus on good decision-making skills. Instead of lecturing, it teaches young adults to take control of situations — as drivers and passengers — by changing their attitudes and taking responsibility for their own driving behavior. Participants examine the fact that they are in control of their behavior and are provided techniques for keeping control in driving situations. Through interactive video participation, workbook exercises and role-playing exercises, they are provided the opportunity to practice making responsible choices.